Enjoy 15% discount when you enter this code at the ASOS checkout. The code works on full and also on some sale items with no minimum purchase. Works in specific countries only. Brand and account/country exclusions may apply. COLLECT - Free Click & Collect Next Day delivery (save £5.95) when you spend £100 or more. UK only, select your collection point and enter this code to redeem this limited time offer. Delivery is Monday to Saturday. IL17 - Enter this code & get 17% discount on full price & sale items. Minimum spend: £50/€69/$79. Valid on orders with delivery address in Israel. Are you in hurry? Spend £100+ and enter code IL17PLUS to get 17% discount + free express shipping. Valid on orders with shipping address in Israel only. $10 bonus + 2.5% off – No promo code for your country? Shop through this link to get 2.5% off and $10 Welcome Bonus when you make purchases totaling $25 or more. We have collaborated with Ebates (a cashback portal) to bring you this international offer. Withdrawn on Paypal or by a check. Valid for new Ebates member. You can be an existing ASOS customer. Are you a student? Students get 10% off at ASOS (all the time) and from time to time they offer an upsized rate (20%). To receive your unique discount code register and complete the validation process either at ASOS student page* or UNiDAYS (only in the UK) or ASOS RU student page (only for students in Russia) using your student email address. The code will be sent to you via email and it is valid until you graduate/until the start of the next academic year. *The unique student discount code applied for via the form is available to students in the UK, US, Germany, France, Australia, Italy, Spain, Austria, New Zealand, Hong Kong, Singapore, Denmark, Switzerland, Belgium, Netherlands and Republic of Ireland. When is the next discount code coming? Although ASOS doesn't announce new codes in advance, we have used our records from previous years to make these predictions*. *Note: These data are not complete and ASOS may release new codes anytime. There is no need to enter a code to get free standard shipping (it applies automatically when your order is over a certain amount). However, you may find the table below useful if you want free express or next-day delivery. *The code was not valid during the last check. ASOSSALEHI - 10% off everything for Australia and New Zealand during Easter 2019. ASOSSALE15 or FIFTEEN - these codes were active in many countries during the Easter 2019 - giving you an extra 15% off already discounted items. ONLINE20 - 20% off everything (includes sale items). Country exclusions applied. GET10OFF, GET20OFF or GET30OFF - Use one of these codes before 1st April 7am GMT and get up to £30 off your £175 purchase. Valid on UK orders. 15HELLO, 30HELLO, 50HELLO - Are you from Belgium, Nethelands or Luxembourg? Get €15 off €100, €30 off €150, €50 off €200. These codes expired on 1st April 9am CET. NOW30, NOW50, or NOW70 - up to $70 off on orders delivered to New Zealand. Codes ended on 28 March 2019. THIRTY, FIFTY, or SEVENTY - $30 OFF $150, $50 OFF $200, $70 OFF $250. Use one of these codes before 28 March 2019 7pm AEDT on your order made in AUD. Valid for Australia. APPWOW - Shop using the ASOS app (available on Adroid or iPhone) and enter this code at checkout to get 20% off. Valid on deliveries to Russian Federation, Belarus, Kazakhstan and Kyrgyzstan. Code expired on 11.00 (Moscow time) 22/03/2019. HAUL10, HAUL20, HAUL30 - Get £10 off £80, £20 off £125 or £30 off £175. Only available on orders delivered to UK and purchased in £ (GBP). Codes expired 27 Feb 2019. ASOSSALEGO - 15% off the marked down price of items included in the ASOS sale. This is the Valentine's Day offer from ASOS and the code is valid in specific countries including Asian countries, some European countries and more. Expires 15 February, 2019. VDAY20 - Valentine\s offer: 20% off everything at ASOS valid in Australia & New Zealand. Expired 15 Feb 19. HEREIS15, HEREIS30 of HEREIS45 - €15 off €100, €30 off €150, €45 off €200. Valid in Netherlands, Belgium and Luxembourg until 12 February 2019. PIG30 - Celebrate New Lunar (Chinese) Year with ASOS and get 30% off everyting! Valid in Asian countries. No minimum purchase. KICKOFF - 20% off valid on order up to $640 (pre-discount). The promo code works when your delivery address is in one of these following locations: USA, US Minor Outlying Islands, and Puerto Rico. Promo code ended on 4th February 2018. 30DOLLARS, 50DOLLARS, or 70DOLLARS - $30, $50 or $70 off your AUD orders with shipping address in Australia. 30PLEASE, 50PLEASE, or 70PLEASE - up to $70 off at ASOS valid for New Zealand. ASOSSALEPLZ - extra 10% off the already up-to-70%-off sale. Valid in selected countries. GIFT125, GIFT300, GIFT500 - enter one of these codes before 11 Jan 19 and save up to 500 HKD. Valid in Hong Kong. YESPLZ20, YESPLZ35, YESPLZ60 - SGD 20 OFF SGD 150, SGD 35 OFF SGD 180, SGD 60 OFF SGD 220. Valid now through 11 January, 2019 in Singapore. GRAB500, GRAB1000, GRAB1800 - spend more to save more. These codes are valid in Taiwan. Save up to TWD1800. ASOSSALEYAS - an additional discount during the up to -70% sale. Works on orders made in RUB with delivery address to Russia, Kazakhstan, Kyrgyzstan or Belarus only. LASTMIN - 25% Off when you spend $200+. Valid only on orders in and to USA, US Minor Outlying Islands, and Puerto Rico. APPTIME - 15% off sitewide - in-app purchases. Expired 17 December 2018. GOGOGO25 - 25% off orders delivered to Russia and Belarus. Expired 13/12/2018. YAY25 - 25% off orders delivered to China. Limited time only. APPYDAYS20 - shop using the ASOS mobile apps and get 20% off sale. Valid on in-app purchases only. Expired: 12th December 2018. CUPONATIONSG15 - 15% off full price items. Valid until 9th December in Singapore. EPIC5 - the biggest saving (25% off) valid for United States during the Black Friday and Cyber Monday. HELLO20 - 20% off everything at ASOS during the Black Friday weekend and Cyber Monday. Valid for specific countries. Can be used multiple times up to a maximum of £500. Ended Tuesday 27 November 2018 at 8am GMT. CLICK30 - amazing 30% off everything at ASOS (Click Frenzy promo) in Australia and New Zealand. The code expired at 4AM AEDT 15th November 2018. SINT15, SINT30, SINT45 - Shop meer, spaar meer (shop more, save more) codes valid in Netherlands. Get up to 45€ off when you spend 200€ or more. GOGOGO30 - Get the possible biggest discount (30% off) during the Single\s Day promotion at ASOS. This code is valid on orders with delivery address in Korea, China, Malaysia, Indonesia, Vietnam, Thailand, Philippines. Expires on 12th November 2018. SINGLES15 - 15% off in Netherlands. GIFTME30 - Get 30% off during the Singles Day event at ASOS. This code works for Singapore and Hong Kong. HURRY30 - 30% off at ASOS. Works in Russia on 10th, 11th and 12th November 2018. APPSNAP20 - 20% off in-app buys. Valid on full price items, but it may work also on sale items (if the sale item is less than 20% off full price). Offer valid in New Zealand and Australia and ended on 8th November 2018. CLICK30 - A massive and rare 30% sitewide discount. This code worked in Australia and New Zealand on the 1st of November. Note: A discount of 20% was applied to beauty products and small appliances. SCREAM15 - 15% OFF everything. Valid in the UK and ROI. Expired 1st November. WOW15 - An international code that was valid in every country except United Kingdom and Republic of Ireland. SPOOKED10, SPOOKED20 or SPOOKED30 - £10 OFF £80 | £20 OFF £125 | £30 OFF £175. Valid on orders delivered to UK only. Expire 29th October 2018. APPLOVE - 20% off full-price times app only. Shop using the ASOS app and enter this code before 9am 27 October 2018. YOURS10 - 10% off everything valid for 2 days only (17/10 - 19/10) in Russian Federation. TAKE10APAC - an extra 10% off everything (valid even on sale items) for some Asian countries (Singapore, Hong Kong, Taiwan, China, South Korea). Expired 16 October 2018. FREE12 - are you from Taiwan? Spend 3000 TWD or more and get 12% off everything with this code. Expired 1st October 2018. TAKE25 - get 25% off everything (also on sale items) when you spend more than 13000 RUB. Valid on deliveries to Russian Federation only. Expired 28 September 2018. TREATME30, TREATME50, TREATME70 the more you spend the more discount you will have. Spend $150 for $30 off, $200 for $50 or $250 for $70 off. Valid only in Australia. Expired: 24 September 2018. SWEETAS30, SWEETAS50, SWEETAS70 get up to $70 off when you spend $250 or more at Asos. Valid in New Zealand. Expired: 24 September 2018. SEPT50, SEPT70 or SEPT100 get $50/$70/$100 off your purchsase of $200/$250/$350 delivered to United States and made in USD currency. These codes expired on 14th September. COLLECT100 - Select Click & Collect as your delivery method when ordering over £100 and then enter this code to redeem free Click & Collect Next Day delivery. UK only. Expired: 10th September, 2018. DAYOFF - Celebrate Labour Day Weekend in the USA with 20% discount valid on everyhing on the ASOS website. Probably working only in United States. Expired 3 a.m. EST August 30, 2018. Multiple orders per customer at up to $660 (pre-discount). APPYDAY - are you from the United States? Download and shop using the ASOS app and enter this code to get 15% off. Expired on 23 August 2018. GOFORIT - receive 20% off full-price items using this code. Valid on orders delivered to Belarus, Republic of Ireland, Kazakhstan, Russia, United Kingdom. Expired on 21 August 2018. TURNUP50, TURNUP70, TURNUP100 - back to school offer from ASOS: get $50 off $200, $70 off $250 or $100 off $350. These codes are valid for orders made in USD, delivered to the US. Expired on August 14, 2018. TAXBACK - taxback time in Australia - enter this code to get 20% off full price items at ASOS. The code expired on July 23, 2018. APPGO - download and shop using the ASOS app and get 20% off full price items. Valid on deliveries to Aland Islands, Belgium, Bulgaria, Cyprus, Czech Republic, Denmark, Estonia, Finland, Greece, Croatia, Hungary, Lithuania, Luxembourg, Latvia, Malta, Poland, Portugal, Romania, Slovenia, Slovakia only. The code expired on 23/07/2018. Enter code APPME at checkout on the ASOS AU app to save 15% off full price only. Offer ended Monday 5pm AEST on the 16th of July, 2018. MINUS10 Extra 10% off the up-to-70%-off sale. Valid in selected countries only (tested and worked in Asian countries - Singapore, Hong Kong, Taiwan,... and in Canada). Try yours. EXTRA - an extra 10% off everything at ASOS valid during the July 4, 2018 3.00am EST. Valid on orders up to the value of $675 with delivery address in the United States. SPARK50, SPARK70 or SPARK100 - are you from Singapore? Get $20 OFF $150, $35 OFF $180, $60 OFF $220 with using these codes now through June 30, 2018. SPARK50, SPARK70 or SPARK100 - up to $100 off when you spend $350. $50 off $200, $70 off $250. The code works in United States. HOLA15, HOLA25, HOLA40 - 15 € off 120 € - 25 € off 150 € - 40 € off 200. Valid for Spain only. These codes expired on 2nd June, 2018. SAVING20, SAVING40, SAVING70 - $20 off $150, $40 off $200, $70 off $250. Valid for Singapore only. These codes expire on 31st May, 2018. 30OFF, 50OFF, or 70OFF Shop before May 27th 2018 at 5pm AEST. at ASOS AU and get - $30 off $150, $50 off $200, $70 off $250. Valid for orders made in AUD, with delivery address in Australia. 30BUCKS, 50BUCKS, or 70BUCKS These codes are valid only in New Zealand on orders made in NZD. $30 off $150. $50 off $200. $70 off $250. The codes expire on May 27th 2018 at 7pm NZST. SUNNYDAYS or EVERY20 20% off everything. These are international codes. Expired: 23 May 2018. FINDERASOS15 15% off orders delivered to Australia. Once per customer. This code ended on 21st May 2018. ALL20 - A promotion for Ramadan 2018 - 20% off everything (including the "Further Reduction: Up to 70% off"). The code is valid for orders delivered to Saudi Arabia, United Arab Emirates, Kuwait, Qatar, Egypt, Oman, Turkey, Tunisia, Morocco, Jordan, Yemen, Bahrain, Algeria, Lebanon, Iraq, Iran, Singapore, Indonesia and Malaysia. Expired 18 May, 2018. SMASH10, SMASH20, or SMASH30 - Shop at ASOS before 8am BST Monday 14 May 2018 and enjoy £10 off Orders Over £80 | £20 off Orders Over £125 | £30 off Orders Over £175. Valid on orders delivered to the UK and purchased in GBP. SHOPBACKSG15 - 15% off regular-priced items valid for orders with delivery address in Singapore. for new & existing customers. Expired 14 May, 2018. APP20 - shop using the Asos app and get 20% off when you enter this code. This is an international code. The code is valid from 1st May 2018. Expiration date is unknown. FURTHER10 10% off sale (Includes Markdowns). Multi-Use, valid in Global, excluding: AU & DE. Max Spend £500. The code ended on 30 April 2018. SPENDING100, SPENDING150 or SPENDING200 Spend & Save Easter Promotion for European countries. SS1000, SS2000 и SS3500 get up to 3500 RUB off your entire purchase when you enter these Spring/Easter promo codes. These codes are valid for Russia only and purchases made in RUB currency. SHOOK10, SHOOK20, or SHOOK30 These codes are valid for United Kingdom and orders made in GBP. You can get £10 OFF £80, £20 OFF £125, £30 OFF £175. LUCKYCHARM - 20% off for St Patrick's Day weekend. Valid on full price items with delivery address in Republic of Ireland, Northern Ireland, Australia, New Zealand and the United States. RUSSAVE1, RUSSAVE2 or RUSSAVE3 - Save up to 2500 руб with these codes working in Russian Federation. The orders must be made in RUB. The codes expired on 22 February, 2018. DOG18 - Celebrate Chinese New Year, (aka Spring Festival or the Lunar New Year) with this ASOS discount: 18% off full priced items for Asian countries (Singapore, HongKong, Taiwan, China, South Korea, ...). Expires 16 February, 2018. SCORE20 20% OFF everything at ASOS, multi use, valid for orders up to max value of $660. Valid on orders with delivery addresses in United Sates only. HECKYES30, HECKYES50, or HECKYES70 Celebrate Australia Day 2018 with savings from ASOS. Spend $150 to get $30 off, $200 to get $50 off or $250 to get $70 off. Valid also on sale! Available on orders delivered to Australia made in AUD currency. Codes expired Jan 26th, 2017 at 7pm AEDT. THRIFTY30, THRIFTY50, or THRIFTY70 Spend and save codes for New Zealand. Purchases must be made in NZD. Get up to $70 off when you spend $250. Spend $150 for $30 off or $200 for $50 off. Codes expired Jan 26th, 2017 at 9pm NZDT. The more you spend the more you save - spend $199.98 or more and get $50 off with promo code JAN50. Spend $250 to get $70 off with code JAN70 or spend $350 or more and get $100 off with code JAN100. These codes are valid only in United States now through January 15, 2018. Celebrate 12.12. shopping day with 20% discount from ASOS when you enter code 20NOW. This promotion is valid for full price items delivered to Asian countries (Singapore, Hong Kong, China,...) one day only. An epic, biggest, discount you can get from ASOS is 30% off everything with code EPIC30. Offered during the Black Friday and Cyber Monday for specific countries. Enjoy Black Friday offer from ASOS that starts on Thurdsday (23 Nov) and ends on Tuesday (28 Nov) - Get 20% off everything with code WIN20. Valid on orders up to £500. Some countries are excluded from this promotion. Get 30% off EVERYTHING when you enter code FRENZYGO. Valid for orders made in AUD and with shipping address withing Australia or New Zealand. Expired on 16 November. WOW30OFF - 11/11 Singles day offer for Asian countries. You could get a massive 30% discount (including sale items). OCTOBER - Halloween code - 20% off everything. First working as an international code, then the offer was limited to the USA and Canada. ASOS15IMBULLNC - are you a new ASOS client? Spend between 40€ and 500€ and get 15% off. Valid for orders with delivery address within Netherlands only. 20MATERNITY - there are 1,200+ maternity products at ASOS. With this code you will get 20% off any of these products, with no minimum purchase. Limited time offer. EXTRASALE - an additional 10% off while there was the sale up to 70%. You could combine the code with the sale. Expired on 18th Oct 2017. UOB20SG - 20% off sitewide discount at ASOS for shoppers from Singapore. Worked at the end of September and early October, also on sale items. Are you new ASOS customer? Get 15% off your first order with promo code 15OFFNEWCUSTOMER. Valid for orders delivered to Netherlands only. PAYDAY30, PAYDAY50, or PAYDAY70 - Get $30 OFF $150 or $50 OFF $200 or $70 OFF $250. These codes work in Australia on orders purchased in AUD. Tax return time - use code TAXSTACKS for 20% off full priced items. Valid in Australia and New Zealand until 17:00 AEST Friday 21 July. GSS2017 - Enjoy the Great Singapore Sale - one day only promotion: 15% off full price items with delivery address in Singapore, Hongkong or Korea only. Promo ends at 5 pm BST on the 14th of July 2017. Celebrate Independence Day (July 4th) with ASOS and save up to $100. Get $100 Off $350 with FREE100 or $70 Off $250 with FREE70 or $50 Off $200 with FREE50. These codes are valid for orders made in USD and delivered to the U.S. only. Valid also on sale items. Enter CITI15 for 15% off or CITI20 for 20% off at ASOS if you are a Citi Credit Card holder. This promo runs from June 1 to June 30, 2017 and it is available for Citibank customers in Singapore, Hong Kong, Thailand, Malaysia and China. Find more information on the Citibank.com.hk (in English) or on Citibank.com.cn website (in Chinese). ASOSYAY – 20% off when you use Paypal as your payment method at ASOS. The code was tested and worked in USA and Canada. YESASOS – 15% off at ASOS. Tested in the UK and it worked also on some discounted items, not sure about other countries, try yours. IMBULLASOSFIRSTTIME – are you a new ASOS customers? This 15% code works only for your very first ASOS order (minimum order value must exceed €54) and your delivery address must be in Netherlands. SWEET – A very rare international code valid for absolutely everything, including sale (up to 70% off) items. It was active at the end of the May during Spring Bank Holiday. Shop ASOS using their mobile app and enter code APP15 for 15% off. Works probably only in Europe excluding the UK. The code expires on 22 May 2017. AUTUMN30 or AUTUMN50 or AUTUMN70 – These codes were active during long Easter weekend in Australia. You could get $30 off $150 or $50 off $200 or $70 off $250. YAY15, YAY30 or YAY50 – Easter promotion: 15€ off 100€ or 30€ off 150€ or 50€ off 200€. Valid in Italy, Spain, Germany and other European countries. YAY1000 or YAY1500 or YAY2500 – ASOS RU offered these coupons for Russian shoppers during Easter. You could receive 1000 РУБ. off 7000 РУБ. or 1500 РУБ. off 8000 РУБ. or 2500 РУБ. off 10000 РУБ. STASH50, STASH70, or STASH100 – Spend and save codes for United States during Easter 2017. ASOSGLAM20 – During Glamour Shopping Week 2017 (01.04.2017 - 08.04.2017) you could save 20% off full price items. As far as we know this code worked only in Germany, Switzerland and Austria. COSTUME20 – 20% off non-sale items at ASOS. Valid for deliveries to Denmark only. No minimum spend. Valid for orders up to 4.200 kr. This code was working in March and April 2017. PATS20 – Enjoy St. Patricks Day. Get 20% off full price items (March 16 - March 18) at ASOS. This discount works only Australia, United States and New Zealand. CHOOSELOVE – 15% OFF full price. Valid on orders up to $900 with delivery country in Australia OR New Zealand. The promotion expireD on 5th March, 2017. ASOSNLCOMPFEB – Buy anything from ASOS own brand collection and enjoy this 15% discount, no minimum spend required. The code is valid in Netherlands only and it works for full price items. NAB15, NAB30 or NAB50 – There are 3 promo code for Australia. The value of the discount depends on the value of your purchase. Get $15 off $100 or $30 off $150 or $50 off $200. Note that your transaction must be made in AUD currency. Codes expireD on 17.2.1017. LEGIT10, LEGIT20 or LEGIT30 – – £10 OFF £75 - £20 OFF £125 - £30 OFF £150. These codes work only for the United Kingdom. Expired: 8am Thursday 23rd Feb 2017. 1000RU or 2000RU or 3500RU – There are 3 codes for Russia which are valid now through February 23rd 11:00 (МСК). Get 1000 руб. off or get 2000 руб. off or get 3500 руб. off. SPEND100, SPEND150 or SPEND200 – These codes are valid for some European countries. You can get €15 off (€100 min spend) or get €30 off (€150 min spend) or €50 off (€200 min spend). The codes expired on 23rd February. NAB15 or NAB30 or NAB50 – $15 off $100 or $30 off $150 or $50 off $200. Note that your transaction must be made in AUD currency with Australian delivery address. SWIPE10 – You could get an extra 10% off while there was UP-TO-70%-OFF SALE on the ASOS website. This international code expired on 13th February. CYBER10 – only for Russia. You could get 10% off (working also on sale items) when you entered this code before 1.2.2017 11.00 AM Moscow time. JAN10N or JAN25N or JAN40N – Are you from Netherlands? Spend €100 and get €10 off or spend €150 to get €25 OFF or spend €200 to get €40 off. DROP30 or DROP50 or DROP75 – these codes were active some days in January 2017 for US orders. The more you spent the more you saved; $30 off $150 or $50 off $200 or $75 off $250. All codes expired on January 17. CNY18 – Celebrate Chinese New Year in Asia with 18% discount. Valid on orders with shipping address in one of these countries: Singapore, Hong Kong, Korea, Taiwan, China, Malaysia, Indonesia, Vietnam, Thailand, Philippines. The promo expired on 16 January 2017. CLICKPICK – 20% off site wide for Asian countries (Singapore, Malaysia, Philippines, Taiwan, Hong Kong, Macau, China, Korea). The codes was valid from 1 November to 12 December and you could use it multiple times. GOGOGO – This was the Black Friday offer from ASOS - you could get an extra 20% discount on orders up to £500. This was an international code working everywhere except the US & Canada (they had a special offer). THANKFUL30 – a massive 30% discount for customers in United States and Canada during Black Friday & Cyber Monday. 20BABYLOVE – this is an international code (working for any countries) for 20% off ASOS Maternity products. USA15 – Enjoy 15% off your order with this code. Works when your shipping address is in the United States. SINGLESDAY – - A big promotion for one day only (11/11). Get 28% OFF when your delivery address is in Singapore or Hong Kong. Other Asian countries can be also eligible for this promotion. DJ1502 – - A 15% site-wide discount on ASOS. Valid with your order in total value of £100 or more and less than £500. Works probably only in Japan. MAJOR20 – - A code for Halloween; 20% off everything at ASOS during one day. Ended on 1st November 2016. 10CUPOSG – - 10% off full price items delivered to Singapore. Minimum purchase to activate this discount is 66.67€. FINDER15OCT – - Spend $50 or more on full price items at ASOS now and get 15% off your entire order (up to a maximum of $1,081 before discount is applied). Valid for orders delivered within Australia only. GROUPON10 – - 10% off $125+ purchase. Valid on full-priced items only. The code works if your delivery address is in United States. MIDFEST18 – - get 18% off any full price item at ASOS. The code works for delivery address probably only in Singapore.. Expired on 16th September, 2016. There were "spend & save" codes for following countries. Note: all these codes expired on 15/09/2016. AUSAVE15, AUSAVE30 or AUSAVE50 – are you from Australia? The more you spend the more you can save; $15 OFF $100 or $30 OFF $150 or $50 OFF $200. Your purchase should be in AUD currency. The codes will work up to max of $950 (pre-discount). Codes expired: 5pm AEST 15/09/2016. Valid for orders with delivery address within Australia only. France: FRSAVE10, FRSAVE25 or FRSAVE40 – Enter one of these codes if your order is over 100€, 150€ or 200€ and receive discount of 10€, 25€ or 40€. Germany: DESAVE15, DESAVE30 or DESAVE50 – If you are from Germany you can grab the biggest available discount (50€). To apply you have to make a purchase of 250€ or more and use code DESAVE50. Alternatively, spend 150€ for 15€ off or spend 200€ for 30€ off. Italy: ITSAVE10, ITSAVE25 or ITSAVE40 – spend 100€/150€/200€ to get discounts of 10€/25€/40€. Spain: ESSAVE10, ESSAVE25 or ESSAVE40 – spend 100€ to get 10€ off or spend 150€ to get 15€ off or spend 200€ or more to get 40€ off your entire order. STEAL10, STEAL20 or STEAL30 – - Are you from United Kingdom? Shop in GBP and you are eligible to get £10 OFF £75 or £20 OFF £125 or £30 OFF £150. Expired 8th September. POCKET30, POCKET50 or POCKET70 – - Are you from United States? Shop in USD and enter one of these codes to get a discount up to $70 off. The offer expired on September 8th, 2016. LASTHURRAH – - Celebrate Labour Day in the USA and Canada with 15% discount code at ASOS. This code works on everything including marked down items. Expires Sep 6, 2016. MOREPLEASE – - an extra 10% off the up-to-70%-off sale. This was an international code working in for all over the world. TWSALE15 – - This code was officially published on the ASOS website and was active for a very long time; you could get 15% discount on orders over NT$5,556. For Taiwan only. FINDER15ASOS – - Spend AUD $50 and enter this code for 15% discount. Valid for Australia only. Ended on 7 Aug.
SUMMER16 – - this code was published to be used officially by students, but it worked also on non-student ASSO accounts. However, it was valid probably only for United States. Offer ended 3 a.m. EST on August 4. USYAY – - 15% off everything (even sale) during the 4th of July. This code can be used once per transaction up to a maximum of $900. Valid in the United States and Canada only. Expired July 5th. BIGTHANKS10 You could get 10% off everything (including items in sale). These coupons have usually a very limited time for use and this one expired in less than 48 hours at 9am BST on 29/6/2016. 5B4E5F65BD80 – This code was active for a very limited time only; you could get 10% off your purchase at ASOS with no min spend threshold required. This was an international code. WOW30 – The biggest discount you can get at ASOS - 30% OFF everything. Valid 24 hours only, it expires 31/05/16 and it works only for orders delivered to Russian Federation and made in RUB currency. HISUMMER – 20% off full priced items with no minimum spending required. This code expires on May 31st, 2016 and it works in United States and Canada on orders up to a maximum of $850. Spend $100 and enter code SCORED15 to get $15 off, spend $150 and enter code SCORED30 to get $30 off or spend $200 and enter code SCORED50 to get $50 off on ASOS AU. The codes expire on 5th May. CASHREWARDS15 – Enter this code at checkout and get 15% off AUD$75+. The code is valid for Australian orders only, up to a maximum of $1,028. This code expired on May 2nd, 2016. 10CUPOXASOS – ASOS GOSF special promo code for 10% off almost everything. Works in Asian countries (tested and worked in Singapore). STUDENT24 – 24 hours 20% off promotion (not only for students). Ended 7.59am on Wednesday 27 April. Tested and worked in the United Kingdom. 18FAST – 18% discount on almost everything at ASOS. Valid for Asian countries (Singapore, Hong Kong, Taiwan and South Korea), with no minimum spending requirement. Ended 21 April. Valid on orders up to max of SGD1072. ASOS ‘Spend & Save’ promotion in April 2016. Depending on your shipping country and value of your basket choose one of these promo codes below. Note that all these codes expired on 21st April 2016. United States: Enter APRIL30 or APRIL50 or APRIL70 when you spend $150 or $200 or $250 to get $30 or $50 or $70 off your order. Russia: Enter APR1000 to get 1000 руб. off (valid for min. purchases over 8000 руб) or enter APR1500 to get 1500 руб. off (valid for min. purchases over 9000 руб) or enter APR2500 to get 2500 руб. off (valid for min. purchases over 10000 руб). Australia: Use one of these codes CHILL15, CHILL30 or CHILL50 depending on the total value of your order and save up to $50. Netherlands: Spend 100€ to get 10€ off with code APRILYAY10. Spend 150€ to get 25€ discount with coupon code APRILYAY25 or spend 200€ to get 40€ off with code APRILYAY40. France: Enter AVRIL10 (min. purchase 100€) to get 10€ off. Enter AVRIL25 (min. purchase 150€) to get 25€ off or enter AVRIL40 (min. purchase 200€) to get 40€ off. Germany: Spend 150€, 200€ or 250€ and enter SCHNAPP15, SCHNAPP30 or SCHNAPP50 to get 15€, 30€ or 50€ Rabatt. Italy: Spend 100€ , 150€ or 200€ and enter APRILE10, APRILE25 or APRILE40 to get 10€, 25€ or 40€ off. Spain: Spend 100€, 150€ or 200€ and enter ABRIL10, ABRIL25 or ABRIL40 to get 10€, 25€ or 40€ off. 10KING – an extra 10% off sale items. Works for specific countries (Netherlands and Belgium probably only) now through 18th April 2016. No min. spend required. ASOSXVERO – 10% off ASOS collections. The code works for selected countries. Expired 10 April 2016. APPY15 – 15% off full price items, exclusive to app only purchases. Probably valid only for orders with Australian shipping address. Code expired 6pm AEDT Thursday 31 March 2016. United Kingdom – Enter MAR10 to get £10 off £75 or MAR20 to get £20 off £125 or MAR30 to get £30 off £150. CLOVER4 – Celebrate St. Patrick’s Day! Enter this code to get 20% off your online order on ASOS. Only available on orders shipped to Australia, United States and Republic of Ireland. MARDIGRASFINDER – 15% off on ASOS branded products, including Mardi Gras Sorted. Valid for orders with shipping address in Australia. LOVEISLOVE – 15% off on full price items. Valid on orders up to a maximum of $900. Your shipping address must be in Australia. You could get discount of 1000RUB, 1500RUB or 2500RUB when you make a purchase of 8000RUB, 9000RUB or 10000RUB. Use one of these codes FEB1000, FEB1500 or FEB2500. Valid in Russian federation. United States: Spend $150 to get $30 off with code FRESH30 or spend $200 to get $50 off with code FRESH50. Valid for transactions made in USD. Netherlands: Enter code FEBYAY10 to get 10€ OFF with your purchase of 100€ or more. Enter code FEBYAY25 to get 25€ discount when you spend 150€ or more. The biggest discount (40€) you can get with coupon code FEBYAY40 with purchase of 200€ or more. France: Spend 100€ or 150€ or 200€ to get reduction of 10€ or 25€ or 40€ with using codes FEVRIER10, FEVRIER25 or FEVRIER40. Germany: Spend 150€ or 200€ or 250€ to get a rabatt of 15€ or 30€ or 50€ with using codes WINTER15, WINTER30 or WINTER50. Italy: Spend 100€ or 150€ or 200€ to get discounts of 10€ or 25€ or 40€ with using codes FEBBRAIO10, FEBBRAIO25 or FEBBRAIO40. Spain: Spend 100€ or 150€ or 200€ to get discounts of 10€ or 25€ or 40€ with using codes FEBRERO10, FEBRERO25 or FEBRERO40. HAPPY18 – Get 18% discount on full price items on ASOS when your delivery address is in Asian countries: Singapore, Hong Kong, Taiwan or South Korea. No minimum spending required. The code expires on 28 February 2016 3pm SGT. FEB10, FEB20, FEB30 – Spend £75, £125 or £150 to be eligible for entering one of these codes and you will save £10, £20 or £30. The codes works probably only in United Kingdom and they expire on 24th Feb 2016. OWNBRAND10VC – 10% off ASOS own brand. Minimum spend: £30. Note: this is not an international code. Works probably only in the UK. Spend $100 or $150 or $200 on any products at ASOS and if your delivery address is in Australia, you are eligible to use one of these promo codes PERF15, PERF30 or PERF50 to save $15, $30 or $50. LINCOLN – Celebrate President’s Day in the USA with 20% discount. Enter this code to get 20% off full price. 10YES – A special Valentine’s promotion: up to 70% off + an extra 10% off with this code. This is an international code valid on everything on ASOS. The promo ended on February 15th, 2016. SWEETMATE – Celebrate Australia Day with 15% discount. This code is valid on everything (including sale) and it works in Australia and New Zealand. The promotions ended at 4am AEDT on the 27th January 2016. JAN1000 or JAN1500 or JAN2500 – use one of these codes when you order exceeds 8000 РУБ or 9000 РУБ or 1000 РУБ. Valid only in Russia until 22nd January 2016. SPLURGE30 or SPLURGE50 – spend $150 or $200 and you are eligible to use these codes to get $30 or $50 off. Valid in United States only, up to $895 (pre-discount). Expired on January 22, 2016. OLDNEW30 – a rare coupon for 24 hours only (14 – 16 January 2016), valid on full price items only. The code works only in specific countries, probably only in Russia. CNY2016 – promo code for new (Chinese) year – flat 18% discount on ASOS.com. Valid in Singapore, Taiwan, Hong Kong and Korea. The code expired on 14th January 2016. HEY10 – 10% off orders delivered to France. Expired on 11th January 2016. RMNDEC15 – For United States, 10% off $125+ orders. Expired January 2nd, 2016. APPEXTRA10 – 10% off everything for everybody using the ASOS app. Expired 27th Dec, 9.00 AM GMT. ASOSXVERONICA – 10% off ASOS own label products, up to max of 700€ per order. This code is valid for delivery address in Netherlands only. Expired on 15th December 2015. APPYDAYS15 – this is an international code valid on ASOS app only. Make any purchase via their mobile applications (Android or iOS) and get 15% off. Valid on sale items, too. Ended 08:00 GMT on 31 December 2015. CUPOXASOS – Get 10% off full and sale price items on ASOS Singapore. The code works probably only for this country. Unknown expiration date of this coupon. BLESSED – A very special and rare promo code that was valid for Black Friday weekend and Cyber Monday. Ended 03.00am ET on 01/12/2015. CYBER – During Black Friday weekend and Cyber Monday you could save 20% on all orders from ASOS. This was an international promo code (valid in all countries). Expired 08.00am GMT on 01/12/2015. PERFECT20 – 20% off products from Petite, Tall, Curve & Maternity. International code. FRENZY30 – this was the best code which you could get for ASOS – 30% off absolutely everything! Valid for Australia and New Zealand only, for transactions made in AUD. Note that this code was active also in 2013 and 2014. Its likely that it will be active again in 2016 in November. SINTERKLAAS – 20% off your entire order (up to max €650). This code worked in Netherlands and Belgium only. ios15 – Did you know that ASOS has mobile applications on android and iOS? With this code you could get 15% off your order made via ASOS iOS app. This was an international code valid via the app only (requires iOS 7.0 or later). Expired 5 a.m. EST or 9am GMT November 13th, 2015. BESINGLES30 – A special 30% discount (worked also for sale items) valid for one day only (11th November). The code could be used for orders delivered to Taiwan, Hong Kong and Singapore only. LUCKY18 – you could enter this coupon to get 18% discount on full price products. Worked only in Singapore and expired on 11 November, 2015. United Kingdom: Get £10 off £75 or £20 off £125 or £30 off 150 with codes: 10NOVEMBER, 20NOVEMBER or 30NOVEMBER. United States: Get $30 off $150 or $50 off $200 with codes: WOWZA30 or WOWZA50. France: Get 10€ off 100€ or 25€ off 150€ or 40€ off 200€ with codes OUHLALA10, OUHLALA25 or OUHLALA40. Germany: Get 15€ off 150€ or 30€ off 200€ or 50€ off 250€ with codes HURRAH15, HURRAH30 or HURRAH50. Russia: Get 1,000 РУБ off 8,000 РУБ or 1,500 РУБ off 9,000 РУБ or 2,500 РУБ. off 10,000 РУБ. with codes YES1000, YES1500 or YES2500. CUPONATIONASOS10 – it was a nordic code (valid in Norway, Sweden and Denmark) giving you 10% discount when your basket exceeded a certain amount (around $60, depends on your country and currency). Expired on 2nd of November 2015. 10GIRLSCENE – This was a special code, created for a Netherlandish blog, giving the readers 10% off ASOS products which are not in sale. Worked until 25 Oct, 2015 23:59. SGCUPONATION – 10% off full priced items. It was active for 2 days in October for orders with shipping address in Singapore. VERONICAXASOS – 10% off ASOS own label products. Valid for customers from Netherlands. Expired 11 October, 2015. HAPPYFIND15 – 10% discount on full priced items for Australian worked during weekend. A minimum spend of $75 was required to activate this deal. 26819C169E9A – 10€ discount (sconto). This is a unique code which was valid for customers from Italy with an order over 50€. You could easily generate yours – just by submitting your email address for the ASOS newsletter. Generated codes worked only in Italy. 44BC83203D09 – 15% off full priced items for new customers. It seems the code works internationally (tested the UK, Australia, Russia). Minimum spend 3200 RUB/$61.73. If the code doesn’t work you can also try these: 44BC69D4D0E6, 4A4686C164AD, 449AD0CC4CF4. Each code is unique and can be used only once. Shop and save codes for Australia: WOO15 – $15 OFF $100, WOO30 – $30 OFF $150, WOO50 – $50 OFF $200. Expired on 20th Sep.
United States: 30WOOHOO – $30 OFF $150, 50WOOHOO – $50 OFF $200. Russia: HAPPY1000 – 1,000 РУБ. OFF 8,000 РУБ., HAPPY1500 – 1,500 РУБ. OFF 9,000 РУБ., HAPPY2500 – 2,500 РУБ. OFF 10,000 РУБ. APPTeenVogue20 – For United States only and it works only if you enter the code through the ASOS shopping application (available on android or iOS). A decent 20% discount on full-priced items. Expired on September 14th. TREATYOSELF – Grab 10% off EVERYTHING during Labor-Day weekend. The code was valid for customers from the United States only. Ended 3 a.m. EST Tuesday. RMNAUG15 – It required a minimum purchase of $125.00 (€96.46) to activate the 10% OFF discount. It doesn’t work on sale items. Worked for U.S. only. ASOSBOX20 – Spend £200 on ASOS.com and paste this code at the checkout to receive an instant discount of £20. ASOSBOX15 – Receive £15 off with your purchase of £150 or more at ASOS. ASOSBOX10 – Receive £10 off with your purchase of £100 or more at ASOS. Note: not valid on already reduced items. 2015SG50 – you could get 20% flat discount on full priced items. Only in Singapore and valid for 24 hours only (6th Aug 21:00 SGT – 7th Aug 21:00 SGT). Are you a student in New Zealand or Australia? You can get now 20% OFF (instead of 10%). Ended 5pm AEST, 6th August, 2015. 15GAMEKINGS – specially created code (kortingscode) for “gamekings episodes” providing you with a decent 15% OFF. Valid for customers in Netherlands only. CHECKITOUT10 – If your order is over $94.81 and under $125 we recommend you to use this code. You will instantly get 9.48 USD off your order (including sale items). Valid for U.S. customers only. Note: If your order is over $120.98 and you are not purchasing items from SALE section, use the code above. MOBVC10 – you could get 10% discount on full-priced items using ASOS shopping app or making the purchase on ASOS mobile website (open ASOS website on your phone or table) and enter this promo code at checkout to activate this mobile discount. LONGWKND – Celebrate Memorial Day with 20% discount at ASOS. Enter this code for 20% off full priced items (non marked down items) up to maximum of $900 per transaction. USA and Canada only. Ends on May 26th, 2015. MVC10 – a discount of 10% percent only valid for customers from United Kingdom with any full priced items purchase over 50.00 GBP. ADD10 – an additional discount for already discounted items. Worked in all countries. SPRING15, SPRING30 or SPRING50 – valid for U.S. customer. Enter these code when you spend $100/$150/$200 and enjoy $15/$30/$50 off. Expired on 8th of April 2015. LOOKAMAZING – 20% OFF on ASOS own label products from womenswear section. Probably valid only for United Kingdom, on order up to max L500. Expired March 24th. RIGHTFIT – 20% discount on Maternity, Tall, Curve and Petite products at ASOS.com. GRAND – Have a happy St. Patrick’s Day with 20% discount – in USA, Australia and New Zealand. The code worked on full priced items and only for 48 hours. CATCH10/CATCH25/CATCH40 – Save €10/€25/€40 with orders above €100/€150/€200. Valid in France, Italy, Spain and other countries. 10FEB – an extra 10% international rabattkod (also on sale items) worked during Valentine’s weekend. DBSxASOS – 10% off on orders up to a maximum of L500. This code is valid for Singapore only. Expired on January 31st, 2015. 20HAPPY – 20% off code worked in UK. 10WELCOME – Are you a new ASOS customer? If yes, then you can use this code and you should get $10 OFF on your first order, over the value of $100 (before taxes and shipping costs). It says this code is not active now (however, not expired so try again later). GIMME10 – Enjoy 10% discount (on sale items, as well as non-sale items – full priced items). This code worked internationally, without country or account restrictions. GLAMOURXMAS – Get 20% off on ASOS own label items, which are not in sale section. The code is valid for Netherlands and Belgium only, now through January 6, 2015. APP10 – use this code on shopping using ASOS app (available on iPhone/iPod touch, iPad and on Android) for extra 10% off on top of the existing sale. TINSEL20/DECEMBER20 – both 20% off codes, the first one valid only in Australia but giving you also free express shipping. Ideal for Christmas gifts, however, expired one week before Christmas. FRIDAY2014 – This code was specially created for Russia, Australia, New Zealand, Kazakhstan, Ukraine and Belarus. Valid until Tuesday 2nd of December. 20% OFF. CYBERWKND20 – 20% OFF during Black Friday/Weekend and on Cyber Monday. Not like in the U.S. where the discount is bigger (30%) but still a worth time for shopping! Works in UK and other regions. Ended on Tuesday 2nd December in the morning. ILOVEMONDAYS – The biggest discount is in the United States and Canada. Massive 30% OFF on everything. ASOS didn’t disappoint their customers in these regions during Cyber Monday. 031014asosndd – This was an international promo code, worked in every country and on all items listed on ASOS (sales items included). ASOSFINDER15 – 15% off exclusively for Australian customers (during weekend 21 – 23 Nov). Unfortunately, it has expired. 30FRENZY – Expired on November 20th. It was probably the best code ever. You could receive 30% OFF on absolutely everything – both full price and marked down items. Unfortunately, very limited time (for 48 hours only) and for Australia only. PERFECTFIT – an international code which worked on items from sections Curve, Petite, Tall, Maternity on ASOS website. 20% off. Expired on November 17th. 10OFF100/25OFF150/40OFF200 – If you are from United States use these codes if your order is above $100. Be quick, this promo ends on November 15th, 2014. In case your order is in range $75-$100 we suggest you to use the code listed below. QUICHE10 or QUICHE25 or QUICHE40 – These codes work only on Australian version of ASOS website and on orders with delivery in Australia. The more you spend the more you save. Spend $100/$150/$200 and save $10/$25/$40. 10MORE or 10EXTRA – Officially published code on ASOS.com, as well as on all the subpages for different countries. This is an international promo code with 10% OFF. It can be used on already discounted items, which means that you can get a sale item (70% OFF) with+ 10% OFF (code). HAPPYLFW – 20% discount (korting) exclusively for customers from Belgium. Valid on orders up to 500 GBP. ASOSGLAMOUR – This code worked internationally (but now it is a country-specific code) and it gives you 20% OFF! This code will probably expire at 23:59 on September 8, 2014. Valid on orders up to max of L500. GET15 – international, officially published 15% coupon code has been already expired. USWELCOMETREAT – Spend $100 and get $10 discount on your first order. Valid on US orders only. SGNATIONALDAY20 – 20% OFF, limited time only, working for some asian countries. HAVE10 – officially published also on ASOS homepage; 10% OFF also on sale items, expires on September 1st, 2014 at 08:00am BST. 10% international code: HOT10 also officially published on ASOS website, works on selected items for a limited period of time. “Get it or regret it”. GAME10 – an international code, 10% off, it could be doubled by playing a game on ASOS (up to 20%). Expired now. PARTYINTHEUSA – this code was created for July 4th celebration, 20% off, unfortunately not valid anymore. SorryAgainForTheDelay0606 – It was 15% off L1.00 and over in every country. Now it is inactive. HEYSTUDENT – A massive 25% discount code which works not only for students. Put something into your shopping bag at ASOS website and hit the green Checkout button. 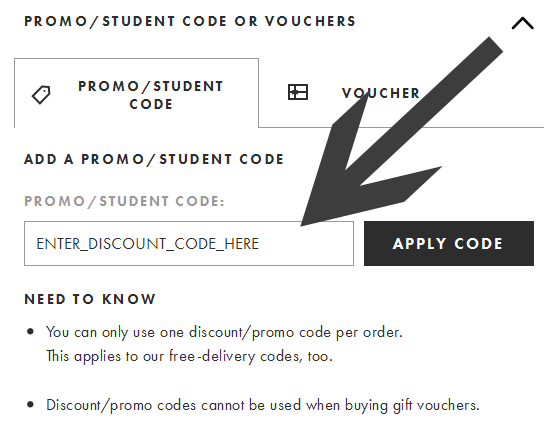 In the next step log into your ASOS account (or create a new one) and find “Promo/student code or vouchers” on section at the checkout page. Click the "Apply code" button to see if your code has been accepted. Where does the ASOS deliver? Almost everywhere. Currently ASOS can deliver orders to 246 countries. There are 3 types of delivery: Standard Delivery, Next-Working-Day Delivery and Nominated Day. Some of them are not available worldwide. Choose your delivery country on this page and see the delivery costs and times for you. Most of the orders are delivered within 3 - 14 business days. I don’t like the actual color of my purchased dress. Can ASOS send me a dress with different color? No. But, you can return your item within 28 days. Submit your return in your ASOS account. Simply log into your account and select an item or items you want to return. Wait for an email from ASOS with your return label and form. Download and print them and you are ready to send the product back. Read more about returns for your specific country on this page. Feel free to submit a new order anytime. The nordic 10% code (CUPONATIONASOS10) also doesn’t work on Germany. They really are dragging their heels, aren’t they? SUNNY20 does not work for Germany. But I didn´t read any restrictions. Any idea? There is a note that account or/and country restrictions may apply. Also tried from Germany – didn’t work, said it wasn’t valid for my delivery address. Didn’t work in Australia either. No promo code up-til now? Boy, something seems not right. If you have an international working code, please do share…..
and are you from Israel? Enter promo codes 10HAPPY, 25HAPPY or 40HAPPY at check out to redeem. All codes expire on May 15th, 2015 at 09:00 CEST. Valid on orders to The Netherlands only. CHECKITOUT10 works with all the conditions listed. Thank you! Last time when I saw promo code for international customers was 3 monts ago WTF ? I know right… Yeah the Dutchies have has free returns in shipping but I don’t really need that… I just want a nice promo code forrrrrrr discount! I agree with you. Tooo long ago they posted an international or european promo code.. I’ve been waiting a long time now for a 15% or most preferably a 20% off! :( Before they used to have promos all the time now they have highered their prices and no promo codes.. Only for US or AUS peeps.. Finally! there is a new 10% international code: ADD10. I just use this promo code one time. For next order, it cannot be used although it’s not expired. Be aware, they will charge you shipping when you use Gimme10, even on items over $40. I didn’t be charged postage cost while I used Gimme10. DECEMBER20 works like a charm in Germany. BUT: The prices gone up exactly at 6 pm GMT, when this discount code became valid. All other discounts, which previously had been valid like the 30%-Winter-Discount, expired! And now, after midnight, there are more rise in prices! I can compare it, because I was lucky to make my order prior to the second price rise. So be careful, make a screenshot before the discounts show up and compare, before you buy! GET20 valid on 12Dec for 24hrs. work in SG. FRIDAY2014 works for Singapore too! Not sure if it’s Norway only, either way it works regardless if you are a student or not. And they only change the code each month, nothing else, because 1410 = october 2014. That means it only works once per account, though, each month. Ends 03:00PM (SGT) 21th Sep 2014. Use it on top of the 25% off tops promo (25% off valid until 03:00PM (SGT) Monday 22nd September 2014 on selected items) that’s ongoing currently. Again, works in Singapore but unsure if it works internationally. ASOSGLAMOUR doesn’t work international anymore. Earlier this week it worked, now it doesn’t. Scumbag Asos. SUMMERDONTGO – 20% off everything, not sure when this expires..
Hi today is the 20th of August and the code ASOSGLAMOUR still works. Thanks to this great site I have an extra 20% off my purchase. I am from The Netherlands and it is still active over here. ISRAEL18 gives 18% over 35 pound. “SGNATIONALDAY20” I suppose only for Singaporeans. 20% off everything for 24hours. Ends 7am SGT tomorrow. “SAVE15” 15% off everything including outlet. Offer ends Monday 3pm (CST/HKT/SGT)/Monday 4pm (KST/JST) 4th August 2014. Not sure if it’s international. This works for Singapore orders! CHUT15 > 15% off, only valid for French customers. “YOURULE” for 25% off for US customers ONLY. FETCH15 for everything! Ends Sunday 8 June. TWENTYORNAH just worked for me for $20 of $80 or more site wide. I’m in the US so I don’t know if it works for other countries. CELEBRATE10 – 10% off full-priced items. Works worldwide (I think so). works even for gss sales item. haven’t worked for my country, but might work for yours!!! or €20- €40.- off and max spend of €650.Certain brands may be excluded. Working in SG. will expire on Sunday. Note: ASOS does not endorse this page and has no relationship with Codesium. Can you develop a successful business based on an online-only idea? Yes, you can. Check out ASOS, a company founded in UK back in 2000, offering a wide selection of clothing, fashion and beauty products. ASOS is becoming one of the most popular online store, not only in UK, but also in the United States, Australia, Europe and Asian countries (especially Hong Kong, Singapore, Taiwan, ...). Customers love ASOS user-friendly website, products and fast delivery. Moreover, ASOS has a relatively good promo codes policy - they provide new codes on regular basis. Read full ASOS Review. Please click here for country specific ASOS promo codes if you are from Russia, Ukraine, Belarus or Kazakhstan. ASOS is a trademark of ASOS.com Limited. ASOS provides promo codes for specific countries and/or accounts. On this page we list all known ASOS promo codes which can be found on the internet, social media platforms, unofficial blogs and forums. Naturally, you can experience difficulties using such promo codes which are not eligible for your country and/or ASOS account. Codesium cannot guarantee the validity of all listed codes on this page.